Monstera deliciosa, is a tropical, flowering plant native to southern Mexico and Panama. It is famous for the ridges and holes found on it’s more mature leaves, giving it the nickname “Swiss cheese plant.” Part of the Araceae family of plants, it can grow up to twelve feet tall with leaves that spread nearly two feet wide. 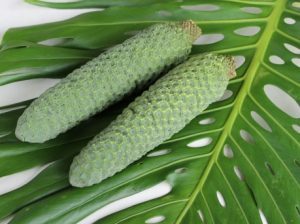 When growing in their native climates monstera produces fruit, known as “Mexican breadfruit,” that look like ears of corn with a pineapple-like flesh, and are said to taste like a medley of banana, mango, and pineapple. These fruits can take up to a year to ripen, and can cause mouth and stomach irritation if consumed before ripe. Important to note, all other parts of the plant are toxic to both humans and animals if eaten. Monstera deliciosa is an easy plant to care for in your home. They are relatively low maintenance, and will thrive in most environments. The plants do well in areas with filtered, indirect light, as too much harsh sunlight will scorch the leaves. They prefer soil that is consistently, slightly moist, but are sensitive to overwatering. They typically need to be watered no more than once a week, or if the top two inches of soil are dry. Because monstera are natural climbers, once the plant grows more mature it helps to add a stake or trellis to provide extra support. 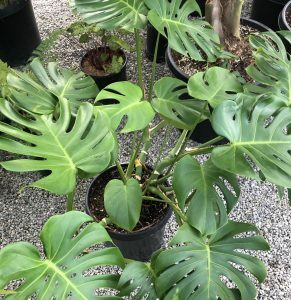 If your monstera grows too large, they respond well to trimming, and you can even use the cuttings to start a new plant! 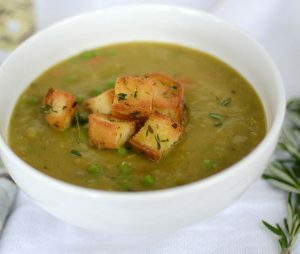 Split Pea Soup is perfect, healthy meal for a cold winter day. Full of flavor and loaded with potatoes, peas, and carrots, it is not only just filling, but also delicious. For a crunchy addition, top it with homemade croutons! In 6-quart stockpot over medium heat, sauté onions and garlic with a few tablespoons olive oil, oregano, salt and pepper until onions are translucent, 10 to 15 minutes. Add carrots, potatoes, split peas and vegetable stock. Bring to boil and simmer, uncovered for approximately 40 minutes or until peas are soft. Stir frequently. While soup is simmering, cut up baguette into 1-inch cubes and toss with olive oil and chopped parsley and spread out on a sheet tray. 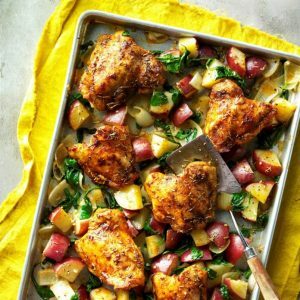 Place in oven for approximately 10 minutes or until crisp. Enjoy soup served hot with croutons.